In 2010, American philanthropists donated approximately $3.3 billion to charity – and 19 of the 53 top givers were Jews. George Soros ranked first with $332 million contributed in 2010. New York City Mayor Michael Bloomberg was No. 2 with $279.2 million. Irwin and Joan Jacobs, Eli and Edythe Broad, and Leonard Blavatnik, respectively took places four through six, with $117 million to $119 million in donations. But are American Jews not doing enough for other Jews? Stephen and Nancy Grand gave more than $20 million of their $28 million of their charitable donations in 2010 to the American Technion Society, that supports the Technion: Israel Institute for Technology. 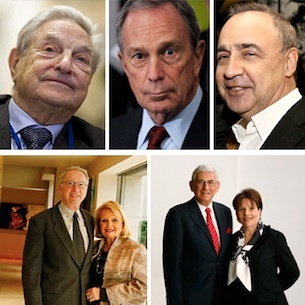 Whereas, Soros gave $1 million to World ORT in September, and Bloomberg gave a smaller donation to the Jewish Association for Services for the Aged, their gifts to Jewish organizations made-up a small proportion of their overall giving. Hedge fund manager, William Ackman and his wife Karen gave away $59.3 million last year. At 44, Ackman is one of Wall Street’s toughest players and a regular on the dais of the UJA-Federation of New York’s annual Wall Street banquet. He made his most significant Jewish contribution in the past year, directing a move to bail out the Center for Jewish History in New York from its $30 million debt with a gift of $6.8 million. Irwin Jacobs, founder of Qualcomm, gave a $100 million-plus San Diego Symphony with a $100 million-plus gift last decade, he and his wife, Joan, have chosen to give away most of their savings through a donor-advised fund at the Jewish Community Foundation of San Diego, where Joan Jacobs is a board member. Last year, they gave the fund $39.1 million, which will be spent on both Jewish and nonsectarian causes.